Airbus Military has begun flight-testing a modification to add winglets to the C295 medium transport and surveillance aircraft – one of a series of product developments underway on the market-leading type. The winglets, which are short extensions to the wingtips of the aircraft, have the potential to improve performance in the take-off, climb and cruise phases of flight by increasing the lift-drag ratio. Possible in-service benefits include improved hot and high runway performance, increased range and endurance, and reduced operating costs. First flight of the wingletted aircraft took place with complete success at Airbus Military’s Seville facility in Spain on 21 December. 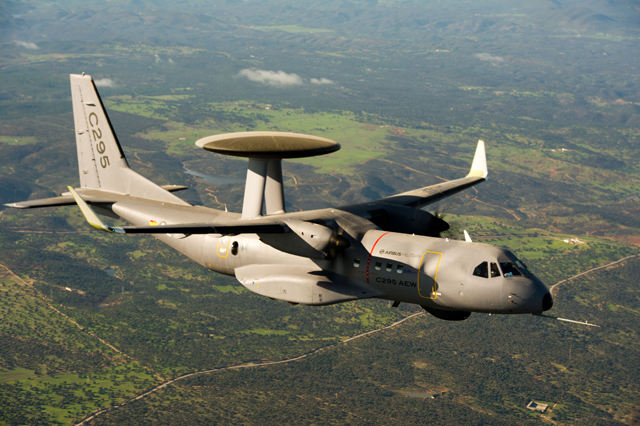 Data from that flight is being analysed and will be added to data from future flights, providing the basis for a decision on whether or not to incorporate winglets into the C295 design. The photograph shows the C295 during its first flight with winglets. The new generation C295 is the ideal aircraft for defence and civic missions to the benefit of society, such as humanitarian actions, maritime patrol, and environmental surveillance. Thanks to its robustness, reliability and simple systems, this medium sized tactical airlifter provides the versatility and flexibility necessary for personnel, troop and bulk or palletized cargo transportation, medical evacuation, communication and logistic duties, and certified air-dropping capabilities. Its mix of dual technology civil/military equipment ensures success in demanding tactical missions, growth potential for systems development, as well as compatibility with the latest civil airspace requirements. The C295 is part of Airbus Military’s family of light and medium airlifters which also includes the smaller C212 and CN235. Kalau bisa C- 295 di sipilkan, utk pelayanan route menengah di Indonesia dan sambil belajar lebih handal penguasaan ilmu. Setelah mahir baru beralih, ke pesawat yg lebih canggih dan lebih kokoh yaitu pesawat tempur.